School is over ! Why not go to France... in Edinburgh?! Join Marion (Théâtre Sans Accents) at L’Institut français for a week of French cultural and linguistic immersion on stage and at the tip of the tongue! 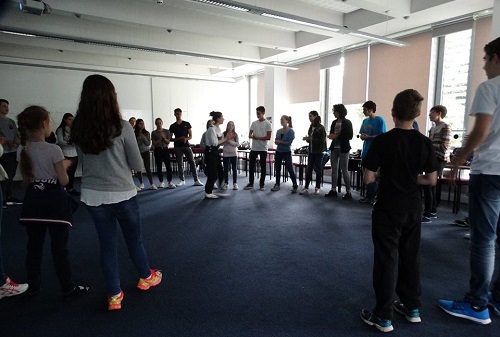 Young people will work towards an end of week performance that they will have devised for their friends and family. No pressure, no exams just the best of both worlds: arts and languages! All levels welcome! With Dans l’hexagone! , embark on a journey through the different French regions to become a bit more Gallic with the help of some famous comics characters: Asterix, Spirou, Nana and more. Participants will discover the art of story-making and story-telling by using props, music, scripts and body language in order to tell their own story in French. We will focus in particular on daring to speak French and building up confidence in speaking a foreign tongue. (Day place also available on request). N.B: Participants will be fully supervised at all times. Please provide a packed lunch for the break (1 h our). Healthy snacks and water/juice will be supplied throughout the day.